In flight training, there are basically two parts to complete – a theory part and practical part. 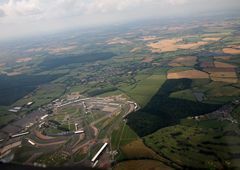 To begin with, you will need the knowledge in areas such as aerodynamics, principles of flying, human performance and limitations, etc. Then you will have to put theory into practice in trying to fly a plane. But before you really board a plane to practice what you have learned, there is an important part that you must master – the procedures. Different countries and different airports do have their own set of rules and protocol to follow. 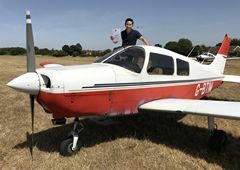 To be able to comply with these rules and procedures are crucial for pilots, especially student pilots, in maintaining flight safety. A lot of student pilots find it quite difficult to fly in an unfamiliar environment. 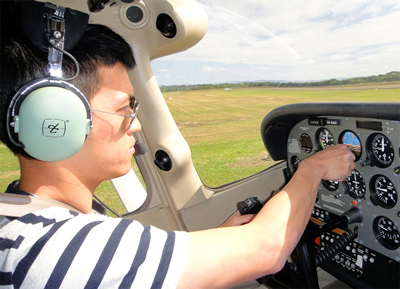 We therefore have tailor-made our courses to the particular airfield that you are going to fly later in Australia. We follow the requirement and procedures of that particular airfield and its associated training areas and landmarks, reporting points for the design of our flight simulation exercises. Thanks to the latest Geographic Information Systems (GIS) technology on the Internet, we make use of satellite images to help students understand how flying is really like. Such experience is particularly useful to student pilots for visual navigational flying and is only made possible in the very recent years. We have introduced a whole series of learning materials from one of the major aviation theory training services providers in Australia. The learning materials are tailored to the needs of our courses at various stages. These materials are well proven and are used widely by many airline and military cadet training programmes. One of the highlights of this programme is the extensive use of Information Technology to assist students' learning. A series of Computer-Based Training materials, with rich multimedia content, will be used as the primary instructional tools in classroom teaching. Other IT-based training tools include simulators for radio navigational aids, interactive radio-telephony practice CD-ROM, etc. An impressive multi-screen projection system has been set up at the HKU SPACE Aviation Laboratory for flight simulation demonstration and practice purposes. With the help of the latest flight simulation software and hardware, you will find this simulation experience with highly realistic visual effects exceptionally helpful to your future flight training in Australia. At different stages, tests will be conducted to assess students’ mastery of theory and knowledge as they proceed through the 3 or 4 modules. Timely feedback will be provided to help students identify their strengths and weaknesses and improve their learning. 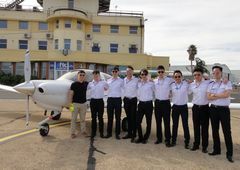 It is also one of our goals to equip students who wish to sit for the Basic Aeronautical Knowledge (BAK) theory test for the Recreational Pilot Licence (RPL) licence and the Private Pilot Licence (PPL) theory test. For those who are taking the RPL and PPL courses, we provide comprehensive mock examinations at the end of the courses for them to prepare for the real ones. 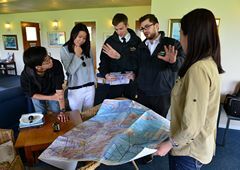 On completion of the relevant theory courses and simulation exercises, students may wish to go for real flying in Australia or in the U.K. Each year HKFTC will organise flight training tours for students according to the levels of theory courses that they have completed. For those who have completed the Sky Experience theory course, they may go for the 10-hour flight training practice. During the training, a qualified flying instructor will be accompanying the student all the way to practice safety procedures, checks, and general aircraft handling exercises such as take-off, climb, turn, descend and landing. For those who have completed the First Solo or RPL theory courses, they may go for the 20-hour flight training practice. 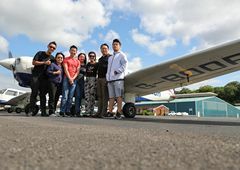 During the training, a qualified flying instructor will be accompanying the student to practice everything in the Sky Experience session plus circuit flying, radio-telephony, airfield and emergency procedures. 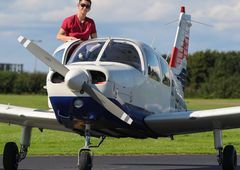 When the student is able to demonstrate satisfactory performance in flying skills and proper attitude towards flying, they may be allowed to go for a solo flight in the circuit. This decision is to be made by the instructor and Chief Flight Instructor based on professional judgement. 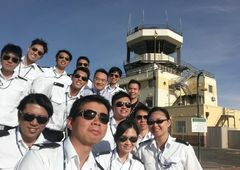 Though the time for first solo may vary for different people, many students can go for their first solo in about 20 hours of training.